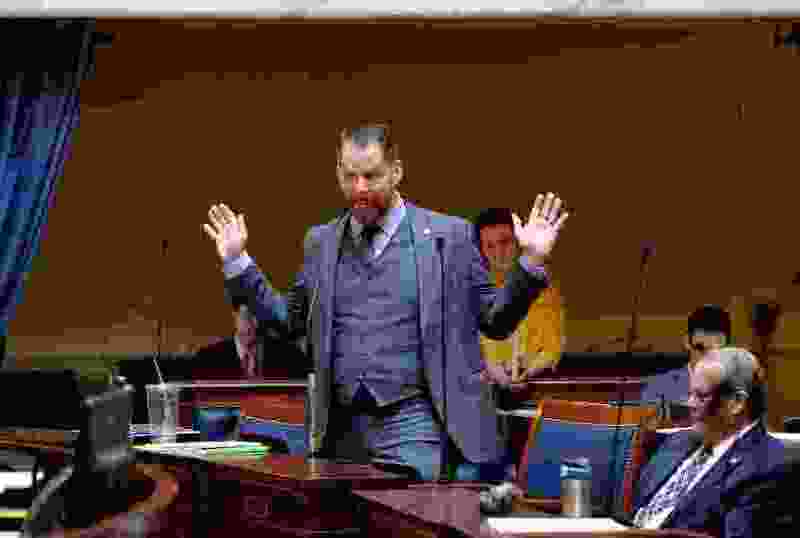 (Francisco Kjolseth | Tribune file photo) Sen. Jacob Anderegg, R-Lehi, becomes animates as he speaks on SB171, which now will allow legislators to intervene in court to defend the laws they pass Ñ instead of depending on the attorney general's office to do so. Prior to last week’s election, state Sen. Jacob Anderegg said he planned to sponsor legislation repealing Proposition 3 if voters approved the initiative fully expanding Medicaid in the state. But voters did approve Prop 3 — by a margin of more than 6 percentage points according to unofficial results — and Anderegg said Thursday that a total repeal of the Medicaid expansion is probably not “palatable." “I don’t think that my colleagues are interested in doing a full-fledged repeal,” he said. Election results will be certified later this month, with Proposition 3 taking legal effect in December. The initiative includes a 0.15 percent sales tax increase to generate roughly $90 million, which will then be combined with $800 million in matching federal funding to provide health care coverage to 150,000 low-income Utahns. Anderegg said he continues to believe that the cost of expansion will outpace the new sales-tax revenue. And that deficit, he said, will cut into the funding available for other state programs like public education. While there may not be an appetite for a complete repeal, Anderegg was confident that alterations will be made by state lawmakers. Utah Gov. Gary Herbert said he opposes a repeal of the proposition during his monthly KUED news conference on Wednesday. But he added that adjustments may be necessary to control Medicaid costs under the expanded program.